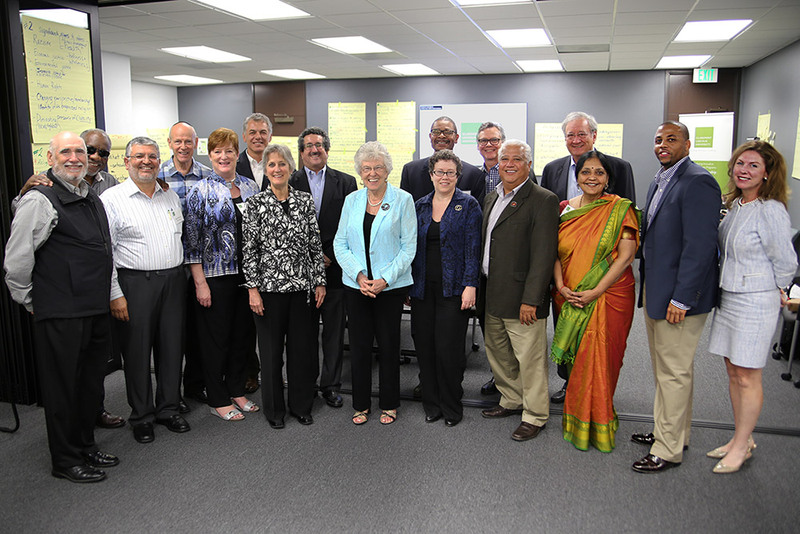 Claremont Lincoln University is bringing interfaith leaders from around the world together to promote peace with the establishment of the President’s Committee on Interfaith Action. The university is committed to developing compassionate leaders to promote social change. It believes that religion can be both a source of conflict and healing, and that interfaith is a necessary step toward peace. Formulating a set of creative initiatives to enrich global interfaith activity. 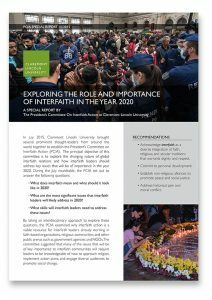 Members meet regularly to discuss and evaluate the importance of interfaith action as an emerging skillset for leaders already working in faith-based organizations, religious communities and other public arenas such as governmental agencies, NGOs, and the civil service, and to formulate creative recommendations to combat polarization and injustice around the world. The President’s Committee on Interfaith Action held its first meeting to discuss religious conflict, racism and a growing lack of civility and compassion in the world today. The recent meeting launched the development of ongoing relationships between leaders of various causes, all of whom are committed to taking part in a dialogue for collaboration and change. The Rev. Joan Brown Campbell is an international activist for peace. Her commitment to social justice was sparked during her life-changing work with Dr. Martin Luther King Jr., and deepened in the struggle to end apartheid in South Africa. Archbishop Desmond Tutu referred to her as a “woman of courage and compassion” pointing out that she was the only woman in the clergy procession of over 200 for his enthronement as Archbishop of South Africa. She negotiated between Fidel Castro and President Bill Clinton the ultimate return of Elian Gonzales to his father in Cuba, and traveled with Clinton to attend the funeral of Yitzhak Rabin in Israel. She led a delegation to present the Catholic edition of the New Revised Standard Version of the Bible to Pope John Paul II, and was co-director with Rev. Jesse Jackson of the mission to Belgrade where with the help of the Serbian Orthodox church, they successfully negotiated the release of American soldiers held captive. Campbell, working in concert with Paul Gorman, Carl Sagan, Dean James Morton, and former Vice President Al Gore, founded what is today the National Religious Partnership for the Environment, and continues as Chair of the Board. Her commitment to growing the global compassion movement is reflected in her work with Charter for Compassion International, currently serving as Chair of the Global Compassion Council. She is Co-Chair of the Global Peace Initiative of Women, providing leadership to GPIW’s important work with women throughout the world, and was the former Chair of the Global Health Council. She is also a member of the Claremont Lincoln University Board of Directors. Eileen Aranda, Ph.D., is President of Claremont Lincoln University and a published expert on management and organizational development. She spent many years as a management consultant focused on facilitation of the strategic management process, development and implementation of organizational change efforts, assessment and mediation of internal organization problems and management team development. She has taught at Arizona State University and The American Graduate School of International Management. Her management experience, in both private and public organizations progressed within human resources, operations, production and product development to the level of subsidiary president. She holds an MBA and Ph.D. with an emphasis in strategic management and organizational development from the University of Washington and is the co-author of Teams: Structure, Process, Culture, and Politics (Prentice Hall, 1998). Darrell Ezell, Ph.D., is Director of the M.A. in Interfaith Action program and the Center for the Study of Religion, Culture, and Foreign Affairs at Claremont Lincoln University. He has extensive experience as both a researcher and practitioner in the fields of religion and interfaith relations, international affairs, and grassroots peacemaking. He has held academic posts at Tulane and Louisiana State University and worked at the U.S. Department of State and the University of Arkansas Clinton School of Public Service (William J. Clinton Foundation). Prior to his government and NGO service, he has been active in grassroots peacemaking efforts in New York City with the Interfaith Center of New York and Interfaith Worker Justice in Chicago, Illinois. He earned his Ph.D. in Religion and American Studies from the University of Birmingham in England, M.A. in Systematic Theology from Union Theological Seminary, and B.A. in Psychology from Alabama A&M University. He is the author of Beyond Cairo: U.S. Engagement with the Muslim World (Palgrave Macmillan, 2013). Mohammed Abu-Nimer is a Professor in the International Peace and Conflict Resolution program at the School of International Service and Director of the Peacebuilding and Development Institute at American University. An expert on conflict resolution and dialogue for peace, his work has focused on the Israeli-Palestinian conflict and on application of conflict resolution models in Muslim communities. Abu-Nimer has also conducted interreligious conflict resolution training and interfaith dialogue. In the last decade, Abu-Nimer has completed many evaluation projects and reports of peacebuilding and development programs. As a scholar/practitioner, he has been intervening and conducting conflict resolution training workshops in many conflict areas around the world, including Palestine, Israel, Egypt, Northern Ireland, Philippines (Mindanao), Sri Lanka, and other areas. Abu-Nimer is the co-founder and co-editor of the Journal of Peacebuilding and Development. He has authored and co-authored many books, including Peace-Building By, Between and Beyond Muslims and Evangelical Christians, Interfaith Dialogue: A Guide For Muslims, A Shared Future: Local Capacities for Peace in Community Development, Modern Islamic Thought: Dynamic, Not Static, and Nonviolence and Peacebuilding in Islam: Theory and Practice. He received his Ph.D. in Conflict Analysis and Resolution from George Mason University, and an M.A. and B.A. from Hebrew University in Jerusalem. Rev. Lee Barker, D.Min., has served as President and a Professor of Ministry at Meadville Lombard Theological School since 2003. Prior to his appointment he served 25 years in the Unitarian Universalist parish ministry. A graduate of the University of Chicago and Meadville Lombard, President Barker has led the theological school through its creation of an innovative program of ministerial formation that infuses practical experience in parish and community settings with academic coursework. Kim Bobo is the Founding Director of Interfaith Worker Justice. She was named one of 14 faith leaders to watch in 2014 by the Center for American Progress, and one of Utne Reader’s “50 Visionaries Who Are Changing Your World” in 2009. In 1976, Bobo became director of organizing for Bread for the World, a Christian organization that works to combat hunger. During this time, she wrote her first book, Lives Matter: A Handbook for Christian Organizing. In 1986, she became an instructor at the Midwest Academy, a community organizing training institute in Chicago, Illinois. While at the Midwest Academy, Bobo and her colleagues co-authored Organizing for Social Change, a fundamental text in community-based organizing. In 1989, Bobo became involved with a strike by coal miners at Pittston Coal. Attempting to organize religious leaders to support the workers, she was startled to find that almost no religious organizations had labor liaisons. She started an informal network of religious leaders to share information about campaigns for worker justice that year. In 1991, she founded the Chicago Interfaith Committee on Worker Issues (Interfaith Worker Justice). Bobo graduated from Barnard College with a B.A. in Religion and later received her M.A. in Economics from the New School for Social Research. Dr. Bhikkhu Bodhi is an American Theravada Buddhist monk, ordained in Sri Lanka and currently teaching at Bodhi Monastery and Chuang Yen Monastery. He is founder Buddhist Global Relief, which fights hunger across the world, and is chairman of the Yin Shun Foundation. He was appointed the second president of the Buddhist Publication Society and has authored several publications grounded in the Theravada Buddhist tradition. Born in Brooklyn, New York, from Jewish Parents, he obtained a B.A. in philosophy from Brooklyn College and later a Ph.D. in philosophy from Claremont Graduate University. In 1984 he was appointed English-language editor of the Buddhist Publication Society and in 1988, became its president. In 2002, he retired from the society’s editorship while still remaining its president. In 2000, at the United Nations’ first official Vesak celebration, Bodhi gave the keynote address. He has published numerous works throughout his career. Born in South Africa, Rev. Dr. Allan Aubrey Boesak is a theologian, humanitarian, prolific author and tireless advocate for social justice. Boesak studied at the University of Western Cape and earned his doctorate in theology from the Protestant Theological University in Kampen, the Netherlands. His early activism and service led to international recognition as an influential leader in the fight against apartheid. During the 1980s he worked alongside Desmond Tutu and Nelson Mandela to lead efforts against apartheid and promote reconciliation. His leadership in theological, church and academic settings is equally expansive and spans decades. He served as a moderator of the Dutch Reformed Mission Church in South Africa and as vice-moderator of the General Synod and moderator of the Regional Synod of the Western Cape. He has served as a keynote speaker and Bible study leader at several ecumenical assemblies including the World Council of Churches, All Africa Conference of Churches, Asian Christian Conference, Caribbean Council of Churches and South African Council of Churches. He has taught and lectured at theological institutions, college and universities throughout the world, and his scholarship has yielded multiple honorary doctoral degrees from universities in the United States, Canada, England and Switzerland. He has authored 17 books, and edited or co-edited four, in addition to publishing numerous articles on theology and politics. Chloe Breyer is an Episcopal Priest in the Diocese of New York, who, since September 11, 2001 has traveled extensively to Afghanistan in an effort to help rebuild in the areas of education, health and agriculture. She is a board member for Afghans4Tomorrow, an Afghan-based NGO that supports 222 first- through eighth-grade girls in home schools where their education continues to be threatened. Breyer is the author of The Close: A Young Woman’s First Year at Seminary (Basic Books 2000) and has chapter contributions to What Can One Person Do? Faith to Heal a Broken World (Church Publishing 2005), Challenging the Christian Right From the Heart of the Gospel (Beacon Press 2006) and The Gender Imperative: Human Security vs. State Security (Routledge 2010). Dr. Linell Cady is Professor of religious studies and the founding Director of the Center for the Study of Religion and Conflict at Arizona State University. Trained in modern western religious thought, her work focuses on the relationship of religion and the public/private boundary, with primary attention to the American context. Topics of particular interest include the construction of the modern category of religion and its interface with understandings of the secular and the public and the contested role of religion in public life. She is the author of Religion, Theology and American Public Life (1993) , and co–editor of Religious Studies, Theology, and the University: Conflicting Maps, Changing Terrain (2002), Religion and Conflict in South and Southeast Asia: Disrupting Violence (2007), Comparative Secularisms in a Global Age (2010), and Religion, the Secular, and the Politics of Sexual Difference (2013). Sister Margaret Carney, OSF, STD, is the 20th President of St. Bonaventure University, previously serving as dean and director of the Franciscan Institute of St. Bonaventure. She holds master’s degrees from Duquesne University (theology) and St. Bonaventure University (Franciscan Studies) and her doctorate (theology) was awarded by the Franciscan university of Rome: the Pontifical University “Antonianum.” She is a member of the Atlantic 10 Council of Presidents and the Commission on Independent Colleges and Universities. She previously served as the chair of the Board of Directors of the Association of Catholic Colleges and Universities, the Association of Franciscan Colleges and Universities, and the United States Catholic Conference of Bishops’ Committee on Education. Her honors include the Lifetime Achievement Award from Business First of Buffalo for Women of Influence and the Citation Award from the National Federation of Just Communities, Buffalo. Her teaching and lecturing has encompassed service in the U.S., Europe and Asia. She holds nine honorary doctorates and is a member of the prestigious Century Club of Duquesne University. Rev. Jerry Campbell, Ph.D. is a co-founder and former President of Claremont Lincoln University and former President of Claremont School of Theology. An ordained elder in The United Methodist Church, Dr. Campbell previously served as Chief Information Officer and Dean of Libraries at University of Southern California, and as chief librarian and faculty member at the Iliff School of Theology, Perkins School of Theology, and Duke University. Dr. Campbell holds a B.A. from McMurry University, an M.Div. from Duke University, an M.S. in Library Science from the University of North Carolina at Chapel Hill, and a Ph.D. in American History from the University of Denver. Paul F. Chavez is the President of the Cesar Chavez Foundation, a national nonprofit organization established over 50 years ago by his father, labor rights leader, Cesar Chavez. The foundation, based in California, aims to improve the quality of life for working families through housing, education and community service opportunities across the U.S. with an emphasis on Southwestern communities. Paul has spearheaded the impressive growth of the organization over the last decade and diversified the spectrum of services and enterprises that the foundation is involved with. Today, the organization’s affordable housing portfolio covers 42 communities with more than 5,000 high quality, amenity-intensive units for low-income residents and continues to grow each year. The Cesar Chavez Foundation has also steadily grown its presence in radio communications with its Radio Campesina network. Radio Campesina reaches more than a half million listeners each day and is focused on providing culturally relevant news, programming, and educational information to its audience. Paul also oversees the National Chavez Center in Keene, CA in partnership with the U.S. Parks Service. A registered U.S. historic landmark established to preserve and promote the legacy of Cesar Chavez, the center serves as host to educational, corporate and faith groups from across the country. Rabbi Mark Diamond teaches graduate courses in Practical Rabbinics at the Academy for Jewish Religion California and is initiating an undergraduate course in Interreligious Experience and Engagement at Loyola Marymount University. He has served as the Executive Vice President of the Board of Rabbis of Southern California and Director of the Los Angeles region of the American Jewish Committee. Rabbi Diamond is a past president of the Los Angeles Council of Religious Leaders and has led study tours of judicatory officials, clergy, diplomats and community leaders, including a mission to the Vatican and Jerusalem highlighted by an audience with Pope Benedict XVI. He received his B.A. in Liberal Arts from Carleton College and M.A. in Jewish Studies and rabbinic ordination from The Jewish Theological Seminary. John L. Esposito, Ph.D. serves as University Professor as well as Professor of Religion and International Affairs and of Islamic Studies at Georgetown University. He is the Founding Director of the Alwaleed Center for Muslim-Christian Understanding in the Walsh School of Foreign Service. Previously, he was Loyola Professor of Middle East Studies, College of the Holy Cross. Past President of the American Academy of Religion and Middle East Studies Association of North America, Esposito has served as consultant to the U.S. Department of State and other agencies, European and Asian governments, corporations, universities, and media worldwide and ambassador for the UN Alliance of Civilizations and was a member of the World Economic Forum’s Council of 100 Leaders and E. C. European Network of Experts on De-Radicalisation. Esposito’s books and articles have been translated into more than 35 languages. Dr. Esposito’s interviews and articles with newspapers, magazines, and the media in Europe, Asia, and the Middle East include: The Wall Street Journal, The New York Times, The Washington Post, The Economist, The Guardian, The Times of London, CNN, ABC Nightline, CBS, NBC, and the BBC. Rev. Dr. Robert Franklin, Jr.
Dr. Robert Franklin, Jr. is a professor of moral leadership at Emory University in Atlanta and Director of the Religion Department of the Chautauqua Institution. In 2013, he was a visiting scholar in residence at Stanford University’s Martin Luther King, Jr. Research and Education Institute. He is president emeritus of Morehouse College, where he served as the 10th president from 2007 through 2012. He provides commentary for the National Public Radio program, “All Things Considered,” and weekly commentary for Atlanta Interfaith Broadcasting Television. He graduated Phi Beta Kappa from Morehouse in 1975 with a degree in political science and religion. Franklin holds ordination in two Christian denominations: the American Baptist Churches USA and the Church of God in Christ. Franklin earned the master of divinity degree Christian social ethics and pastoral care in 1978 at the Harvard Divinity School, where he also served as assistant director of Ministry Education. Other pastoral positions include assistant pastor at St. Paul Church of God in Christ in Chicago and Protestant chaplain at St. Bernard Hospital, also in Chicago. He earned a Doctorate in Ethics and Society and Religion and Social Sciences and studied internationally at the University of Durham, United Kingdom. Franklin is the author of three books: Crisis in the Village: Restoring Hope in African American Communities (2007); Another Day’s Journey: Black Churches Confronting the American Crisis (1997); and Liberating Visions: Human Fulfillment and Social Justice in African American Thought (1990). He serves on the boards of the Salvation Army, the CNN Dialogues Advisory Committee, and NASA’s 100-year Starship Project Advisory Board. A seasoned traveler, Franklin has studied seven languages and visited Africa, Asia, Europe, the Middle East, and the Caribbean. Rev. Welton Gaddy, D.Min. is President of Interfaith Alliance, a national, non-partisan grassroots organization that celebrates religious freedom by championing individual rights, promoting policies that protect both religion and democracy, and uniting diverse voices to challenge extremism. Dr. Gaddy also serves as the Pastor for Preaching and Worship at Northminster (Baptist) Church in Monroe, Louisiana, and he is the author of over 20 books addressing religion in American life. Every week, he hosts State of Belief on Air America Radio, where he explains and explores the role of religion in the life of the nation. He provides regular commentary to the national media on issues relating to religion and politics. Dr. Gaddy is recognized as a leading advocate for protecting the boundaries between religion and government. He has been a forceful critic of the faith-based initiative and, has been at the forefront of efforts to pass comprehensive hate crimes legislation, end religious profiling and keep religion out of public classrooms. Dr. Gaddy received his undergraduate degree from Union University in Tennessee and his doctoral degree and divinity training from the Southern Baptist Theological Seminary in Louisville, Kentucky. Rabbi Mel Gottlieb, PhD. is a co-founder of Claremont Lincoln University and President Emeritus of the Academy for Jewish Religion, California. He holds a doctorate in Mythology/Depth Psychology from Pacifica Graduate Institute where he was an adjunct faculty member. He has also taught at Columbia and Yeshiva University, and the University of Southern California. He is a widely published author, and is former Director of Hillel at MIT and Princeton University. He has served as Rabbi at Kehillat Ma’arav in Santa Monica, CA as well as Westwood Village Synagogue. Gregory Hall, Ph.D. is the Chair of the Department of Political Science at Morehouse College, a position he has held since 2006. In addition, he serves as Director of the International Studies Program, and Co-Director of the Asian and Middle East Studies (AMES) Program. Dr. Hall is a faculty advisor to the Model United Nations team. His main areas of teaching and research are international relations and security, foreign policy, international political economy, Eurasian affairs, and, research methodology. Prior to joining Morehouse, Dr. Hall held appointments at several institutions, including the University of Central Florida, St. Mary’s College of Maryland, and, Izmir University of Economics (Turkey). He was a 1997 Fulbright Fellow in Kazan, Russia. Dr. Hall completed his Ph.D. and Masters in Political Science, with a concentration on International Relations from Howard University and B.A. in German and Political Science from Northwestern University. Imam Mahmoud Harmoush is the Religious Director of the Islamic Center of Yorba Linda in Yorba Linda, CA. Harmoush held several academic and leadership positions at several institutions in Southern California, the most recent includes his appointment to the M.A. in Interfaith Action program’s Teaching Faculty at Claremont Lincoln University. He currently leads the community in Temecula / Murrieta where he also teaches Arabic Language and Islamic Studies and organizes community events. Harmoush joined the World Languages and Literatures (WLL) Department in 2007 to teach Arabic Language and Islamic Culture. He was born and raised in Syria and completed his college education in the United States. He earned a B.S. in Economics from the California State Polytechnic University in Pomona, and M.A. degrees in Islamic Leadership from Bayan Claremont and in Interdisciplinary Studies and Second Language Acquisition from Mountain State University in West Virginia. The Rev. Dr. Serene Jones is first woman president of Union Theological Seminary in New York, a 179-year-old interdenominational seminary. She was formerly the Titus Street Professor of Theology at Yale Divinity School, and chair of the Gender, Woman and Sexuality Studies at Yale University. She received a B.A. from the University of Oklahoma, an M.Div from Yale Divinity School and a Ph.D. in theology from Yale University. She is an ordained minister in both the Christian Church (Disciples of Christ) and the United Church of Christ. In 2016, she is slated to be president of the American Academy of Religion. The author of several books including Calvin and the Rhetoric of Piety and Trauma and Grace, Jones is a leading theologian who regularly contributes to scholarly and public discussions on matters of faith, social justice, and public life. Jyotswaroop Kaur joined SALDEF’s Southern California office with 10 years of experience in youth education programs, teaching, economic and social justice work. In her role at the helm of the Education Initiative, she is responsible for the strategic growth and development of the organization’s two Sikh LEAD programs: The Internship Program and the Leadership Development Program. While she spends the majority of her time running the Southern California Bureau, Kaur has brokered relationships with organizations, government bureaus, and offices on Capitol Hill securing coveted internships for the prestigious Internship Program. She serves on the Board of Directors of SAJE, (Strategic Actions for a Just Economy), a community based organization in South Los Angeles. Kaur graduated with her M.A. in Public Administration, Non-Profit Management and Policy degree from the Wagner School of Public Service at New York University, and received her B.A. in English with a minor in Conflict Resolution from the University of California at Irvine. Charles “Chuck” Keathley is the CEO of the Boy Scouts of America of the Greater Los Angeles Area Council. Chuck began his professional Scouting career at the Atlanta Area Council in Atlanta, Georgia, serving as an assistant district executive, and was later promoted to district executive, senior district executive, field director, and on to director of field service. After much success, he was promoted to Scout executive/CEO of the Erie Shores Council in Toledo, Ohio, and on to assistant regional director of operations for the Central Region when it was located in Naperville, Illinois. Chuck is a graduate of Oakland University and holds a degree in economics and management. George Villalobos, Chief Operating Officer of the of the Greater Los Angeles Area Council of the Boy Scouts of America will attend the July roundtable in Keathley’s absence. Daisy Khan is Executive Director and co-founder of the American Society for Muslim Advancement (ASMA), a New York-based nonprofit dedicated to strengthening an expression of Islam based on cultural and religious harmony and building bridges between Muslims and the general public. Khan regularly lectures around the globe and has participated in panels with Christians, Jews, and Buddhists. She has appeared on numerous media outlets, including CNN, Al Jazeera, and BBC World’s Doha Debates, and she often contributes to documentaries on Islam and Muslims. She is a weekly columnist for the Washington Post’s “On Faith” and is frequently quoted in print publications such as Time Magazine, Newsweek, Chicago Tribune, and the New York Times. Born in Kashmir, Khan spent 25 as an interior architect for various Fortune 500 companies before committing to full-time community service. She is the recipient of numerous awards, including the Interfaith Center’s Award for Promoting Peace and Interfaith Understanding, Auburn Seminary’s Lives of Commitment Award, the Annual Faith Leaders Award, and 21 Leaders for the 21st Century. Susan Katz Miller is a journalist and interfaith activist, and the author of Being Both: Embracing Two Religions in One Interfaith Family (Beacon Press, 2013). A former staff reporter for Newsweek and New Scientist, with years spent reporting from Africa and Brazil, her work has appeared in The New York Times, The Christian Science Monitor, and many other publications. Since the publication of Being Both, she has been speaking and running workshops on interfaith families, at churches and synagogues, libraries and community centers. She recently gave the Sophia Fahs Lecture at the Unitarian Universalist General Assembly. She is also a regular columnist for the interfaith families column of the Jewish Daily Forward, and blogs at Huffington Post Religion and at onbeingboth.com. Miller was recently featured in 2015 on NBC’s Good Morning America. Rev. Dr. Otis Moss III is senior pastor of Trinity United Church of Christ in Chicago and an accomplished author, speaker and activist. His father, Otis Moss Jr., was an affiliate of Martin Luther King, Jr., working together in the Southern Christian Leadership Conference and serving as co-pastor with King’s father, Martin Luther King, Sr., at Ebenezer Baptist Church. Rev. Dr. Moss II is an ordained minister in the Progressive National Baptist Convention and the United Church of Christ, carrying dual standing in both denominations. He is an accomplished author, speaker and activist. His sermons, articles and poetry have appeared in several publications. He attended Morehouse College in Georgia, where he was named by the NCAA as an All-American Track and Field athlete and graduated with honors. He later received a Master of Divinity degree from Yale University. He was ordained as a Baptist minister by his father in 1995. Vasudha Narayanan, Ph.D., holds the title of Distinguished Professor in the Department of Religion at the University of Florida and is the past President of the American Academy of Religion (2001-2002). She was educated at the Universities of Madras and Bombay in India, and at Harvard University. Her fields of interest are the Hindu traditions in India, Cambodia, and America; visual and expressive cultures in the study of the Hindu traditions; and gender issues. She is currently researching Hindu temples and traditions in Cambodia. She is the author or editor of seven books and numerous articles, chapters in books, and encyclopedia entries. In addition, she is also the associate editor of the five-volume Brill’s Encyclopedia of Hinduism. Dr. Narayanan was named University of Florida’s Teacher Scholar of the Year in 2010. Dr. Han Park is Director of the Department of International Affairs and Director of the Center for the Study of Global Issues (GLOBIS) at the University of Georgia. Board in the Republic of China in an area now controlled by the People’s Republic of China, he has spent his life trying to find new ways to use his talents and abilities to serve humankind. He has acted as an unofficial negotiators between the U.S. and North Korea, most recently in the release of Laura Ling and Euna Lee, two American citizens who crossed into North Korea and were arrested. He holds a B.A. in Political Science from Seoul National University, an M.A. in Political Science from American University and a Ph.D. in Political Science from the University of Minnesota. His areas of expertise lie in human rights, sustainable development and East Asian politics. He is the author of several publications, including North Korea Demystified, published in 2012. Harvinder Sahota, M.D. is a member of the Claremont Lincoln University Board of Directors. He is the inventor of the “Perfusion Balloon Angioplasty” (also known as the Sahota Perfusion Balloon). Dr. Sahota holds two dozen patents and many other pending inventions namely: “Red Laser Light” for prevention of Restenosis, “Multi-lobe Balloon”, “Fibrin Coated Stent”, and Inventor of Haemostat (to stop bleeding from the punctured artery after the procedure). He has performed the first coronary Angioplasty in many hospitals around the world including: India, Mexico, Russia, Ukraine, and United States. Presently, he is Chairman of the Emergency Medicine Commission in Orange County, California and Research Director and Advisory Board member of the Metro Hospital-Heart Institute in New Delhi (India), and Tbilisi (Republic of Georgia). He accomplished his residency requirements in the U.S., Canada, and England and holds a license to practice cardiology in U.S. (California and New York) and U.K.
Dr. Muhammad Shafiq is the executive director of the Brian and Jean Hickey Center for Interfaith Studies and Dialogue and professor of Islamic and religious studies at Nazareth College in New York. He also holds the IIIT Chair in Interfaith Studies at Nazareth College. He was the Imam of the Islamic Center of Rochester, Inc. until 2007. Dr. Shafiq holds a Ph.D. from Temple University, and a M.A. and B.A. from the University of Peshawar. Dr. Shafiq has written more than 40 articles and several books, including Interfaith Dialogue: A Guide for Muslims (International Institute of Islamic Thought: second edition 2012). His work promoting interfaith dialogue was recognized at Doha International Interfaith Conference in 2013. He has led intra-faith and interfaith leadership training workshops in Chad, Niger, Indonesia, Belgium, and other parts of the world. Rev. Dr. Ofelia Ortega Suárez, a pioneering woman theologian and ecumenist, was the first Presbyterian woman to be ordained in Cuba. She is also an elected member of the Cuban National Assembly and completed a term as President for Latin American and the Caribbean of the World Council of Churches in 2013. After completing her basic studies in theology and Christian education at the Union Theological Seminary, Matanzas, Cuba, Rev. Ortega attended the ecumenical Institute of Geneva University in Switzerland to do a post-graduate course in Ecumenical Theology. Her training in Europe was also affiliated with the lay training courses of the Evangelical Academics in Europe. She subsequently returned to Cuba and successfully completed her Master studies in Divinity and Education. In 1960 she joined her alma mater, Union Theological Seminary of Cuba as professor of Pastoral Theology. She served there until 1985 as a theologian in Cuba during a crucial phase in the history of the country; she played a significant role in interpreting the challenge of the Gospel to the modern Cuban State and Society. During this period, she also closely associated with several radical women’s and students forums, notably the Student’s Christian Movement in Cuba. Her ecumenical involvement outside Cuba has been closely connected with the institution and programs of the World Council of Churches. For over two decades, she has been closely associated with several Commissions, Committees and Assemblies of the World Council of Churches. Since 1985, she has been Professor at the Ecumenical Institute in Bossey, Switzerland. George Villalobos is currently serving as the Chief Operations Officer for the Greater Los Angeles Area Council. He has been with the organization for over 17 years. George is originally from Los Angeles and attended Catholic school until 1981 when he graduated from Cathedral High School. He and his wife of 27 years have two Eagle Scout sons and a daughter who just graduated high school. Rev. Johnny Ray Youngblood, D.Min., is the Executive Pastor at The Mt. Pisgah Baptist Church in Brooklyn, NY. His commitment to the call for spiritual healing, racial parity, social justice, and economic equity for all people has garnered him national recognition as a prophet, preacher, national leader, public advocate, motivator, writer, and teacher. In 2003, St. Paul Community instituted its economic development corporation, E.D.I.F.Y. (Empower, Develop & Improve Families and Youth) Communities of New York, Inc., with Dr. Youngblood as Chairman. Dr. Youngblood received his Doctorate of Ministry degree from United Theological Seminary in Dayton, Ohio, where he studied as a Samuel D. Proctor Fellow. He earned his Master of Divinity degree from Colgate-Rochester Divinity School in Rochester, New York, and his Bachelor’s degree from Dillard University in New Orleans, Louisiana.